You all know I love ice cream by now – exhibits A, B, and C – but dairy doesn’t always do me favors. Yes, vegan ice creams do exist. However, coconut milk doesn’t always jibe with my system, either. I was lamenting this fact to John recently when he suggested I try another recipe that’s dairy-free but without coconut. One milk that’s never done me wrong is almond milk, so I knew that would replace my half and half . And to keep it thick and creamy, I knew I would need a more traditional ice cream base. To the drawing board I went. 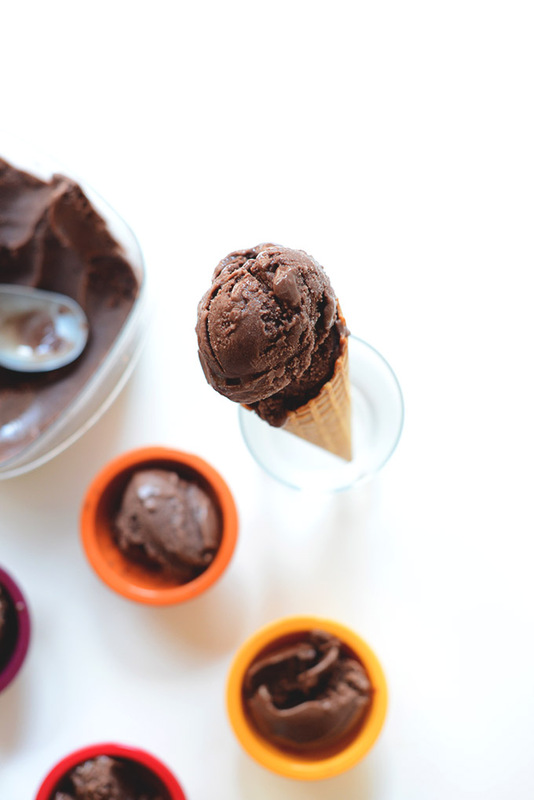 This ice cream recipe is dairy-free, however, not vegan. I understand it’s not for everybody, but for those of us who are are OK with eating eggs but can’t have dairy, this is the recipe for you. I started with an egg yolk and sugar base. Look how creamy it got! Alton Brown taught me that I should look for the “ribbon effect” while whisking. I think I achieved that, eh? Next I whisked the almond milk and cocoa powder in a saucepan over medium heat, tempered the eggs, and mixed it all together with a touch of xanthan gum for extra thickness and a hint of vanilla for more complex flavor. Into the ice cream maker it went and I got super stoked when I sampled a bite and it tasted dreamy. After a few hours in the freezer, it somehow got even better. This ice cream is thick, creamy, sweet, and satisfying, even though it doesn’t have that stereotypical “creaminess” that comes from full-fat whipping cream. That’s the kind of thickness that pains my stomach anyway, so I’m OK with a different kind of luxurious (as long as I’m getting my ice cream fix). This first experiment was a total success, so I I can’t wait to try even more flavors and mix-ins. 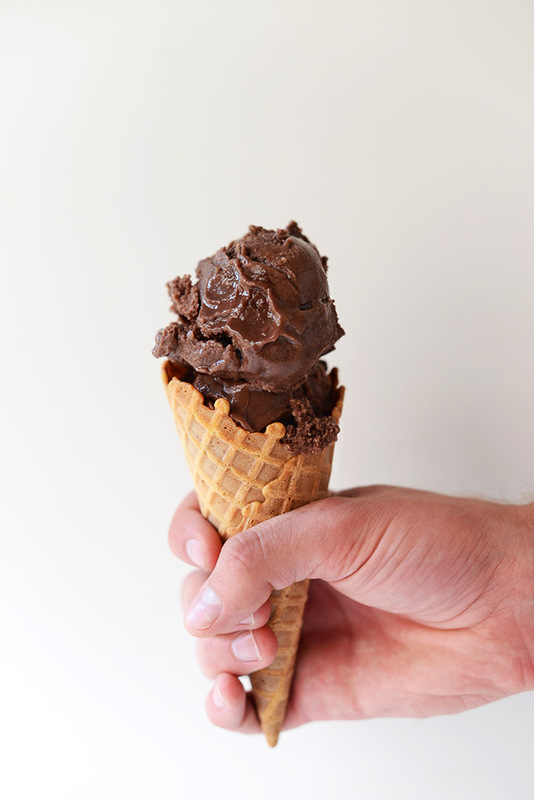 A dairy-free chocolate ice cream based with almond milk, dutch process cocoa powder, egg yolks, and organic sugar. Super delicious and so easy. Add cocoa powder and half of the almond milk to saucepan over medium heat and whisk vigorously to combine. Add remaining almond milk and bring mixture to a simmer, stirring occasionally, then remove from heat after 2-3 minutes. To a large mixing bowl, add the egg yolks and whisk until they lighten in color. 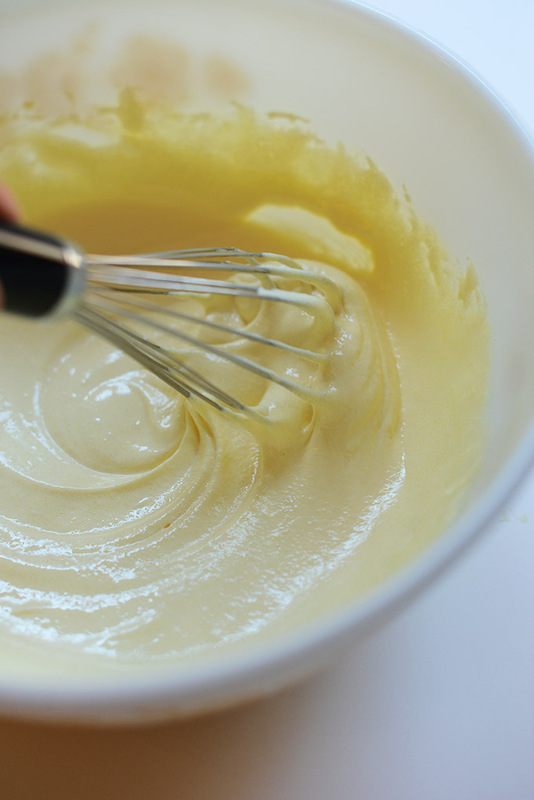 Gradually add the sugar in small increments while whisking vigorously so the two emulsify. You'll know you're done when it's thick and you achieve a ribboning effect - the mixture will form a ribbon when held from the whisk over the bowl (see picture). Next, scoop in roughly 1/3 cup of the warm chocolate-almond milk mixture and whisk to combine, in order to temper the eggs (amount as original recipe is written // adjust if altering batch size). Add remaining liquid slowly and mix until completely combined. Add xanthan gum to the mixture through a sifter and mix once more. This is not necessary, but will help the ice cream thicken. Lastly, add the vanilla extract and stir once more. Then cover and refrigerate overnight or for at least 6-8 hours until completely cooled. Don't forget to chill your ice cream maker canister overnight as well. Once chilled, pour the mixture into the pre-chilled ice cream container and prepare according to manufacturer's instructions. It should take 20-30 minutes. Either consume immediately as "soft serve" consistency, or freeze, covered for 6-8 hours in a freezer-safe container to harden. Let set out for 10-15 minutes before scooping. *For those curious, this is the ice cream maker own (on Amazon). I’ve done this ice cream for my 4 y.o. daughter. She can’t have gluten, cow milk nor soy, so this was the perfect recipe. I did it exactly as indicated -only used brown sugar instead of white- and the result was delicious! My 6 y.o. daughter and husband loved it too!! Of course, me too!! Thanks so much for the recipe. I totally recommend it. Has anyone had luck achieving a similar texture with energy egg replacer, instead? You can cream that egg replacer with vegan butter to make a giant cookie dough after you activate it with warm water- I wonder if it’d still work to make this recipe completely vegan too? If your almond milk already contains some Xanthan fun, is it necessary to add more? Also, will brown sugar work in this recipe? I would still recommend using xantham gum in this recipe! As for brown sugar, we have not given it a try and can’t say for sure. Can we use bob red mills egg yolk substitute? We haven’t tried and can’t say for sure. If you give it a go, report back, Abi! Hi, Your recipe is easy and delicious! Just curious how the yolks are getting cooked? Is the residual heat of the almond milk mixture sufficient to cook them? Could you use “flax eggs” instead of regular eggs in this particular recipe? And if it is possible, would you still need to cook the mixture? Hi Sarah! While flax eggs work in place of regular eggs in almost all recipes, I am not sure it would work for this one! Sorry! I really can’t wait to try this recipe. I have no ice cream maker, though, so I’m going to have to use the stir often while freezing method. I’ve never used xanthan gum before, though, and it seems expensive, so I think I’m going to have to substitute for gluten. Side note, dunno if you’re aware of this but when I googled xanthan gum I found that it’s a laxative. Since you say you have digestive issues if the ice cream ends up giving you trouble you could probably try subbing gelatin, too. Lol I typed gelatin that first time and it autocorrected to gluten. I made this three times: once by itself, which I liked very much. The second time I made it, I mixed in a half batch (6 or 7 medium sized) two-day-old fudge brownies and home made dark chocolate fudge sauce. PERFECT OUTCOME. Third time was a New Year’s Eve treat with two boxes of candy canes crushed up, two tsp. mint extract in the cooking of the ice cream, four oz dark chocolate chunks, and…more fudge sauce on top! Good recipe base for several ideas. Next time I am going to try something different…either a vanilla chai tea, maple bourbon, burnt brown sugar and browned butter, or maybe honey pistachio! I have the base chilling in the fridge to make tonight and eat soft serve-style after dinner. I’ve made custard-based desserts before, and usually after adding the milk to the egg yolks, you heat both in a double boiler to “cook” the yolks and help them to thicken. I noticed this recipe skipped this step. Just curious how the yolks are getting cooked? Is the residual heat of the almond milk mixture sufficient to cook them? I’m excited to try this recipe and all the reviews seem to be positive, but I was just curious about that one point. Thanks! Great recipe! I followed it exactly using Trader Joe’s almond milk (which is not very rich), all the egg yolks and good quality cocoa powder. Mine didn’t really thicken up, but I chilled it as usual and it froze into a wonderful, creamy, dessert that was rich tasting, yet light. I guess what it reminded me of was frozen yogurt. I am not a vegan so the egg yolks weren’t a problem, and for the many people cutting dairy for whatever reason, this recipe is a good one. Also, in comparison to all the super rich non-dairy coconut milk recipes, this one is way lower in fat. One thing to remember is that like a lot of homemade ice creams, this one needs to soften a bit before serving. It will freeze into a brick, but thanks to the xanthan gum once you let it soften it is nice and creamy. Your golden coconut ice cream is absolutely heaven. It was so easy to make. Thank you for making a special day with your delectable golden ice cream. I wish to make almond milk ice cream. Would it be OK to leave the cocoa out? And, could the xanthan gum be substituted for another ingredient? Look forward to making almond flavoured ice cream. I was wondering both the same things. I feel like you could leave out the cocoa and just add in a little extra vanilla and it would be good. And some reviews said they used geltain in place of xanthan gum (unflavored would be best) so I’m not 100% positive but it could work. One question. Could I use the SILK Dark Chocolate Almond Milk which is already sweetened? I just made this and it is delicious. I didn’t let it cool before freezing and it seems to have a great texture. It seems just like gelato. Thank you for this recipe.! Thank you so much for sharing this recipe! Finally a dairy free recipe that is actually creamy and delicious! I added in some gluten free no-bake cookie dough in the last few minutes of churning and it came out absolutely delicious! My husband (who is not dairy free) even liked it and my son and I loved it! Looks delish! Would it be possible to make it without an ice creme maker? This recipe looks amazing – I am however wondering if it could be possible to swap half of the cocoa powder with melted dark chocolate? Hi…I was googling ice cream recipes with Almond milk and came across your dairy free chocolate recipe! I have Crohn’s disease (newly diagnosed) and am seeking ice cream recipes because I miss it terribly. My food is limited…I can’t have chocolate. I like that I have found a “base” to make the ice cream but would love some help. thanks! For me I just add more vanilla and then if you want peanut butter chunks you might be able to freeze bits of peanut butter then drop them in during the last 5 minutes of churning. Any of my mix ins I add during the last 5 minutes. The ice cream will have a soft serve consistency. I hope this helps. I just thought I would give you all an update on my try at making this “ice cream”. I used my old fashioned ice maker that my daughter got me for Christmas. And it turned out AWESOME! It is the best Ice cream I have ever had. My husband couldn’t even tell it was dairy free. Thank you soooooo much! I am allergic to all dairy so I am so excited to try this. My 14 year old daughter bought me an ice cream maker for Christmas so I am going to get to use my new toy and enjoy a tasty treat. Yay! Found your gluten/dairy-free chocolate ice cream recipe (grandson recently diagnosed celiac so am trying to show him that he can still eat everything). do i really need an ice cream maker??? what he really wants is strawberry ice cream – how do i adapt this recipe please? Wow … this has changed my life! I have added some grated dairy free chocolate for the second time, just amazing. Oh my goodness, thank you for this delicious recipe!!! My three year-old son has a severe dairy allergy, but he LOVES all things chocolate. Not only was this recipe off-the-charts delish, it was a blast to make with my son. We melted down some dairy-free chocolate chips and drizzled it in for the last 30 seconds of churning- chocolate chocolate chip indulgence! Thanks again! thank you for this. No one in my house likes coconut milk so I was very happy to find your recipe. I am using almond milk, but I think cashew would taste amazing too. I will try that next. My family loves this ice cream! The only problem I have is half the time I make it it does not thicken. What am I doing wrong? Thanks for the recipe! I was wondering if I could use a sugar subsititue like coconut sugar, honey or agave nectar to replace the white sugar. My family doesn’t do well with sugar. Looking to try this recipe today but I need to read about various sweeteners first. Thanks for sharing your recipes with us! 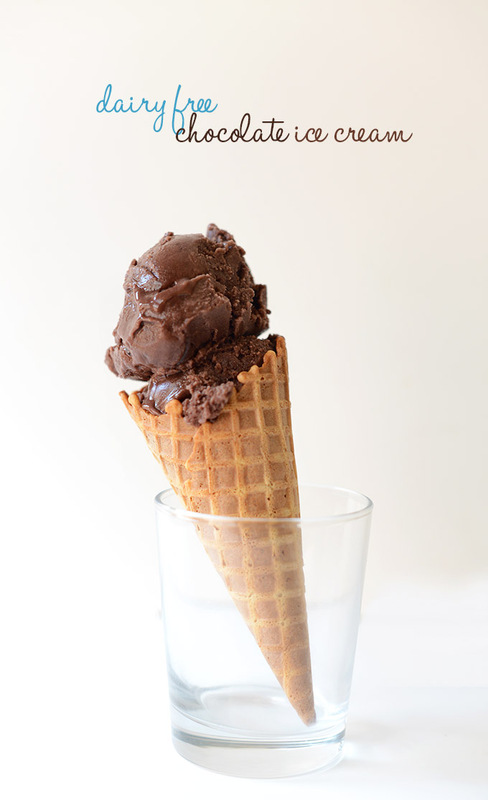 I was thrilled to taste this delicious dairy free chocolate ice cream! clients that are dairy free! could I adapt this recipe to make vanilla? How would I do that? Can you please tell me what your favorite almond milk is? I love Almond Breeze! I’ve tried others and appreciate them as well for different reasons and for different uses. I have a problem. I have tried my hand at making ice cream and it’s been successful, but I would like to store it for later. My question is how to get the ice cream out of the ice cream maker and into the container I’m using for storage. Thanks. This is a lovely recipe that produces a delicious ice cream that tastes great, and allows me to feel great after eating it. I have a goose, so I used two of her egg yolks instead of six chicken yolks. If you have access to goose eggs, they make great ice cream! Also, coconut blossom sugar gives this ice cream a richer flavor, especially when choosing to do a vanilla base, rather than chocolate. Thanks for a mainstay recipe! I have a 6 year old son who can not eat dairy (insensitive- use to be allergic), and also described acid reflux when I made ice cream with coconut milk. Can you eat raw coconut? Do you also get reflux from coconut milk? Thank you for any information. Wonderful – works exactly as published! Thank you very much for this recipe! My children do not tolerate dairy or coconut (but can eat eggs) so this recipe is wonderful :))) I made it with homemade almond milk and vanilla instead of chocolate and it was delicious. They said it was as good as Dairy Queen (ha ha) and they mean that as a compliment! Yay! Thanks for sharing, Autumn! thanks i’m gonna try this recipe soon, just found out that my 1yr old may be lactose intolerant :(. Hi, I am mother of a 2.5 year old son who is allergic to gluten and dairy. I live in India and have no dairy free ice-cream options. I came across this recipe and I am sure it is going to be a lifesaver in fulfilling my LO’s wishes. Just wanted to check if I can use the vitamix instead of ice cream maker? Also, how long can this mixture be stored in the freezer and used. It can be stored for a couple weeks in the freezer. You can use a vitamix but it won’t make it as creamy as an ice cream maker b/c it doesn’t chill it during churning. Hope that helps! I made this for a beach trip with some friends. One of them is severely lactose intolerant and hasn’t had a proper ice cream in many many years. Made this with chocolate almond milk and added Oreo cookies and chocolate chunks. THE BEST dairy free ice cream I (and she) have ever had. Thank you thank you thank you! You made our trip so special. Sharing this with many other friends I know to also be lactose intolerant. Can you please tell me if putting different milks in the ice cream affects the temperature of the ice cream? It’s really important(even though my question might sound a little weird)! I think this is an ice cream revelation. 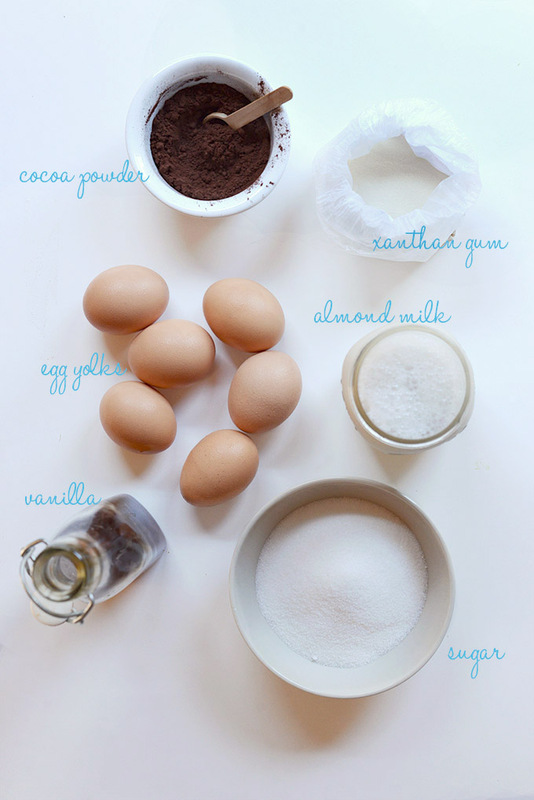 I adapted this for vanilla honey ice cream since I was out of cocoa powder. It is incredibly delicious and creamy. I’m lactose intolerant and love ice cream, but yeah, every dairy-free recipe I could find was vegan and just turned out watery/icy. This one came out perfectly, and I fully plan on using this as a base for the rest of my ice creams. Thank you so much! You’ve just made me very very happy. Yay! So glad you enjoyed it Jess! Hope you enjoy it and adapt it again and again! Can’t wait to try this – looks delicious – would I be able to omit the cocoa and make this plain vanilla flavor? Or how would I make it coffee flavored? Made this for my friend on a beach weekend! Very good!! I made it with chocolate almond milk for extra chocolaty goodness! Added chopped Oreo cookies and dark chocolate chunks. Voted the best non-dairy ice cream she’s ever had, and she’s tried a lot of brands. 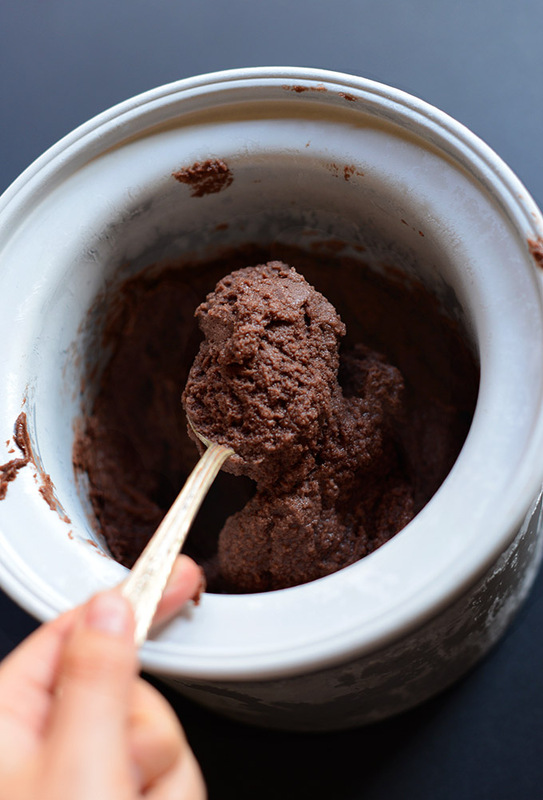 Ok, I have my 3rd batch of this yumminess in my KitchenAid ice cream maker right now :) I use the dark chocolate almond milk AND the cocoa = SUPER chocolatey! I made it with sugar the first time and Truvia with some malted powder the second time (since you use less Truvia than sugar to equal the same sweetness you’d get with 3/4 cup sugar, I added the malted powder to make up the difference) – the second batch seemed ‘dryer’, if that makes any sense. Both batches tasted amazing but I like the consistency of the first batch made with the sugar a bit better – it just scooped easier and held together in the bowl like ice cream should. I’m diabetic and lactose intolerant so this recipe has been a godsend for me. Can’t wait to try other variations of this and the other frozen treats. 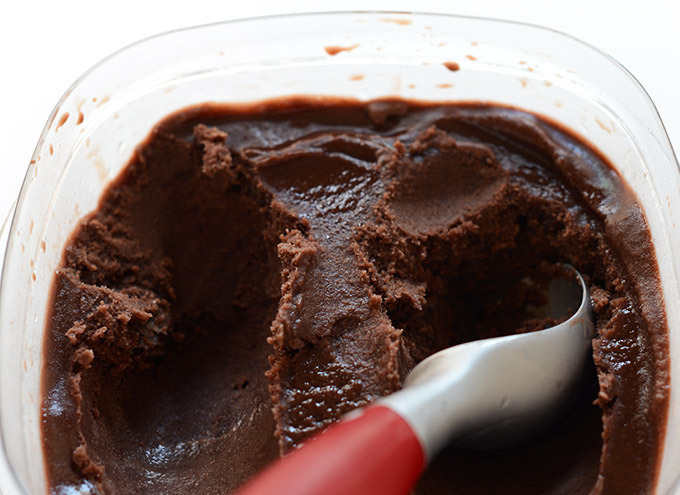 Anyone who is craving chocolate ‘ice cream’ should definitely try this – it’s SO GOOD! Hello:) I wanted to try out the recipe but I didnt manage to find the GUM. Would it be possible to use agaragar as replacement? Have a nice day! Chocolate divinity. This recipe was a scoop above the others I’ve tried. I followed it exactly, sans xanthan gum. I was half-way into it when I realized the raw egg would stay raw (I’m very observant, if you couldn’t tell) so I figured I would go ahead and finish it, try it, then decide where to go from there. My stomach is where it’s going from here – raw egg or not, fantabulous! Is there a way to make vanilla ice cream from this recipe? Deliiiiiicious by the way. Couldn’t get it to ribbon but still turned out fantastic! Good catch! I tag “vegan” out of habit. Fixed! Instead of the vanilla extract, can I use almond extract? If so, any idea of the substitution quantity? The eggs are not cooked will it be safe, or taste like raw eggs? Have you tried P2B the dried peanut butter for flavoring. I just mixed some With almond milk last night and it was awesome. I’m going to try your recipe and flavor it with the P2B tonight. I made this and added bits of your vegan PB brownies – so good!! Smart girl! Thanks for sharing! Thanks so much for your Site, can’t wait to try this but can I make it with out the xgum? Will it be too liquid / icy? It will only affect it slightly. I recommend using it but it’s not necessary. You could also sub tapioca flour or another thickener. Made my batter last night for an overnight chill. This morning it was thicker than any other I’ve tried so I was excited about what was going to happen. Poured it in my kitchen aid ice cream bowl and let the magic begin. I did use a “dark chocolate” cocoa versus regular because I favor the dark chocolate taste. The result … OMG, this is chocolate heaven on a spoon!! Very excited to make more since I can afford to make it rather than buying the expensive stuff that doesn’t even compare in taste! Thank you for sharing this FABULOUS recipe. This looks amazing! Is there any way to adapt this for coffee ice cream? I’ve tried unsuccessfully before- I think the water in the coffee makes ice crystals and ruins the consistency. Christina, add a very strong brewed coffee (almost under-saturate your grounds to get an incredibly strong coffee). Or, alternatively use a coffee/espresso powder. I’ve noticed people always use unsweetened almond milk and add chocolate or vanilla to it. Would the dark chocolate or vanilla almond milk that Silk makes work and help avoid adding the extra sugar? Can’t seem to find a single recipe trying or mentioning this. Hi! I’m planning to try this recipe for my daughter’s 2nd birthday this weekend. We have a GF and DF household, so this is perfect for us. Quick question, though: Do you think that this will work with soy milk? I just have a ton in the house and want to use it up. Thank you!! It will definitely take on a different taste and texture (a bit icier, maybe? ), but if you’re OK with that then go ahead! I’m new here, but I’m going to make this today for our granddaughters birthday party. Would love to see some savoury type snack recipes some time please. Thx you, i know their is a potential for this recipe if i use the right ingredients what brand of cocoa do you use and would I be able to make it with egg substitute or use less egg. I relize that I did use the wrong ingredient I had to throw it away so I hope I can make it good the next time around. The textur was really nice but the flavor was so bad and it upset my stomach it tasted fishie. Do you know off a recipes thats with other alternative instead of eggs that tast good. Rachel, yes I’m aware eggs have a lot of cholesterol, but this recipe requires them to help achieve the creamy texture I was going for. As for the sugar substitution, I think that’s where you might’ve gone wrong. And, I used cocoa powder instead of cacao, so it’s hard to say. Sorry I couldn’t be of more help. When I pût this in the fridge, it was really liquidy and had the consistency of milk. Is there anything I can do to thicken it or will it fix itself in the ice cream maker? You put ice cream in the refrigerator? Great idea! I know a lot of people who need to cut dairy out of their diet for various reasons. This is an amazing and easy recipe, the only thing I’d change is the sugar. Replace 3/4 cup of your ordinary sugar for 1/2 cup of xylitol. I don’t like how sugar affects our bodies so I use xylitol and of course if you’re a diabetic then this will work well. Xylitol causes painful gas and bloating for MANY people, so you might as well just eat better tasting regular ice cream and spend the night on the toilet anyway. 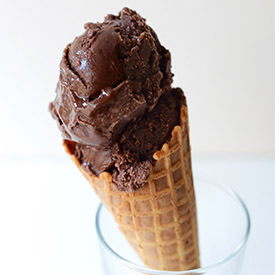 Girlfriend, you are killin’ it with these ice cream recipes! And helping me give my ice cream maker a few solid work-outs as I make the recipes myself. 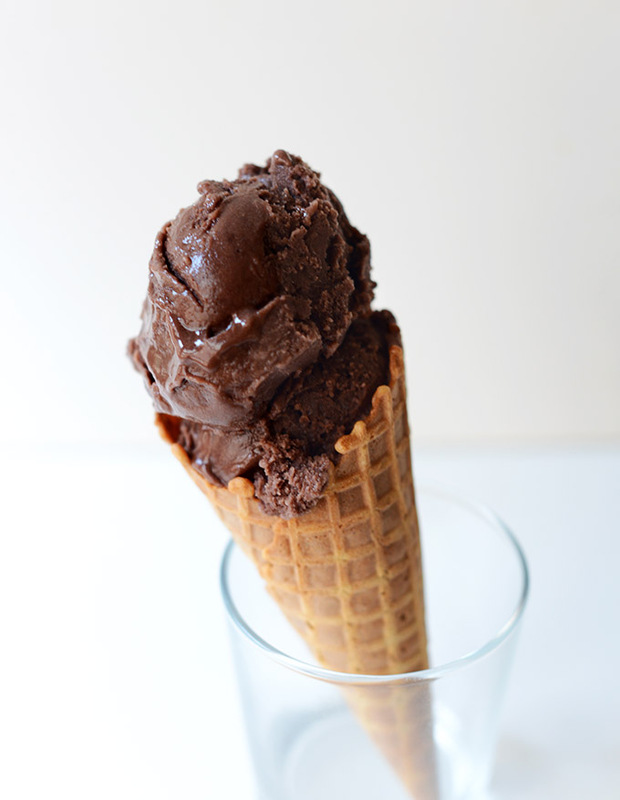 I don’t care what this velvety, dark chocolate “ice cream” is made of, it looks absolutely heavenly! Hi! I was wondering if you think theres anyway you could make this without all the sugar but make sure it doesn’t tasting like dirt? Looks delicious by the way! haha, you could probably cut back to 1/2 cup sugar and it’d be fine. OR could use a little sugar and then the rest honey? NO guarantees though as I haven’t tried it. Eggs really do make for some of the best ice cream! This looks insane and chocolate is my favorite! Such a winner of a recipe!! Thank you thank you thank you for making a dairy free ice cream with almond milk instead of coconut milk!! I can’t have dairy and don’t like coconut so I’ve been searching everywhere to find almond milk as the base! Can’t wait to try it!! Looks terrific but I´m little confused by the egg yolks?! Egg yolks are often used as a base in ice cream to make it extra creamy and custard-like. I asked because I thought that all your recipes were vegan. Many of our recipes are vegan, vegetarian, and/or gluten free, but ultimately they all revolve around being simple. We like experimenting with a variety of diet needs. Here’s a bit more information. I wanted to make this but not sure if you need an ice-cream maker or not? Could you please email me to let me know if I can get away with out one? Renee, an ice cream maker certainly makes a big difference in the overall texture/density of this ice cream but it is not necessary. Just pop it in the freezer and whisk every hour until set. Hope that helps! So does 6 eaggs and coconut flour make that creamy thing . Cool ribbons and a tasty treat. Love it. I’m new here, Ran into one of your recipes on pintrest and signed up. This was my first email And I can’t wait to try It! Milk also not my friend. I love your recipes, I’ve tried one So Far and it was a hit. Thank you, this looks delicious! Love to hear it! Thanks for saying hi, Leah and do let us know if there’s anything specific you’re looking for from our site and we’ll gladly consider adding it! Would flax or chia gel work? Dana, this looks beautiful and delicious! So chocolate and creamy-without cream! Love! Love this! I can’t wait to try this myself! You guys keep coming up with such fun summer treats!! LOVE this! Found!! !…A chocolate frozen fabrication that I can FINALLY digest, devour and totally get behind (without getting a “behind”)…. Question…could I use another ingredient in place of the “xanthan gum?”…Very difficult to find here in France!…I have seen cosses de psyllium (psyllium husks in a flaked form…blonde?) or would ground chia or flax or hemp seeds work?…..or even gelatin?…..Strange that I can find all of those items and not the “gum”! Beautiful visuals…those tiny vanilla flecks…so lovely. Thank you for all of your creative and generous sharing of your culinary acumen! Not sure what farm you grew up on but eggs are not dairy. The author clearly states the recipe is not vegan. You can stop laughing now. Egg is not part of dairy, but you always find it in the dairy section because it has to be refrigerated. How are eggs dairy? Have you ever seen a chicken produce milk?